Greetings and thanks for stopping in. Today I’m sharing my Easy Individual Mini Cheesecake Recipe. It’s a recipe that makes a perfect dessert for a 4th of July party because it’s simple and quick to make, and it serves a crowd. It’s Red, White & Blue in color, and it comes in individual servings so there’s no cutting or extra plates or utensils required. It’s easy to make and easy to serve! Plus they’re really yummy! So let’s get started making this easy Individual Mini Cheesecake recipe right now. It’s a perfect make-ahead recipe because like most things involving cheese, they just get better with age. So you can make them today or tomorrow, store them in the fridge and serve them on Wednesday for the 4th. 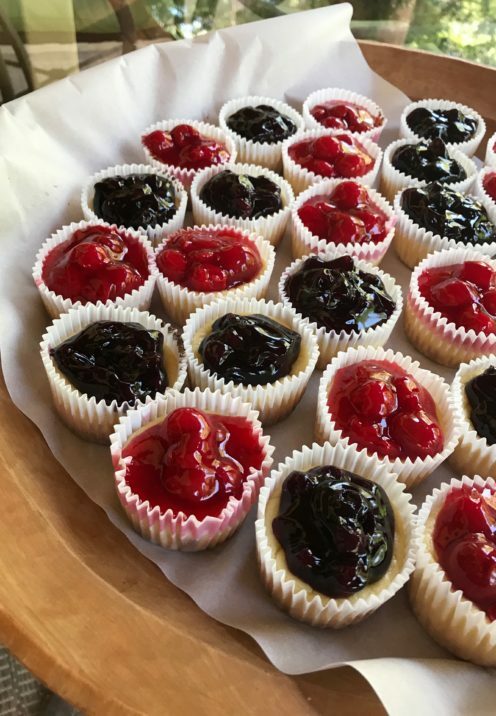 This recipe is designed to feed a crowd, yielding approximately 36 Individual Mini Cheesecakes. If you need less simply cut the recipe in half. However, I find that most folks will take 2, one of each flavor, so plan accordingly. Start by lining 36 muffin tins with white cupcake liners. Add one vanilla wafer to each cup. See, we’re just getting started and it’s easy. 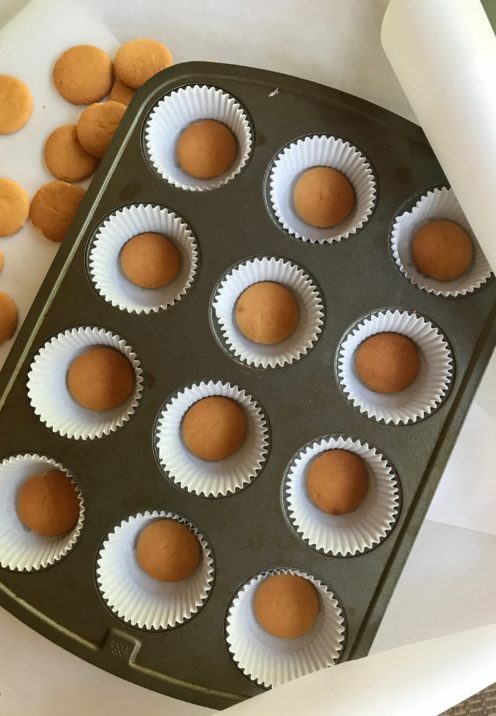 No fancy crust to make, just pre-made vanilla wafers! Next add the eggs to the bowl of your standing mixer and beat them up. Then add the sugar, vanilla and cream cheese to the bowl and continue mixing until the batter comes together. It will remain a bit lumpy and that’s OK. 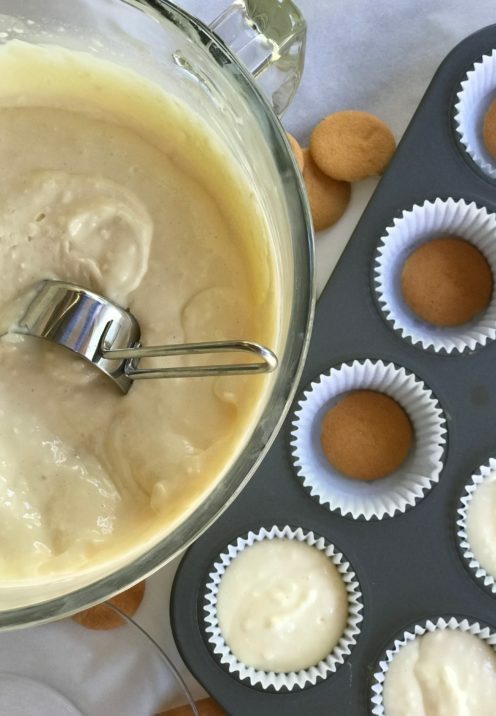 Using a 1/3 cup dry measuring cup, scoop the batter into each cup, filling them about 2/3rds full. Once you’ve filled all the cups, place them in the preheated oven and bake for about 30 minutes until the batter is set. 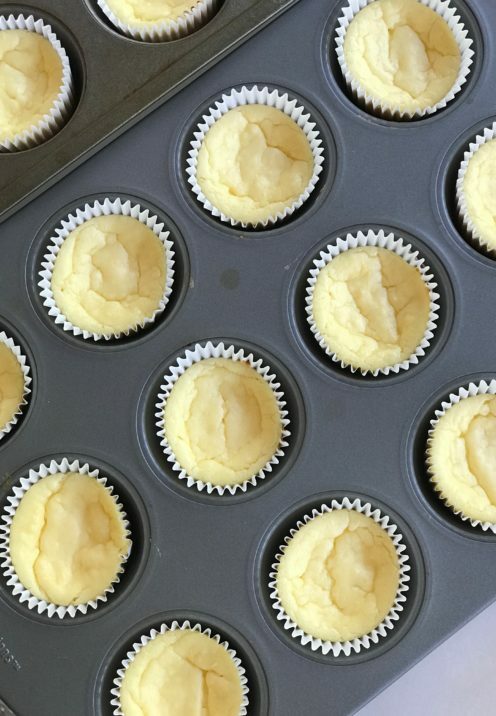 Remove the Mini Individual Cheese cakes from the oven and let them cool completely in the pan. They will be puffy at first and then they will settle down and look wrinkled. If you’re not going to serve them for a day or two, now’s the time to place them covered in the fridge. You won’t fill them until the day you plan to serve them. 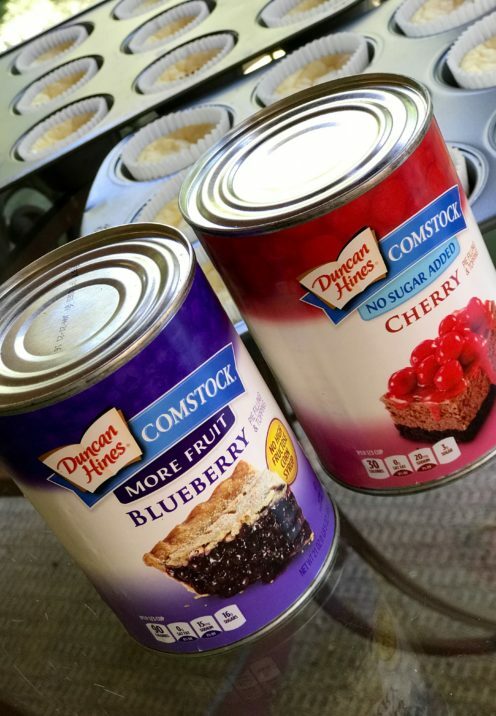 It calls for ready-made, canned pie filling: 1 can each of Cherry & Blueberry. 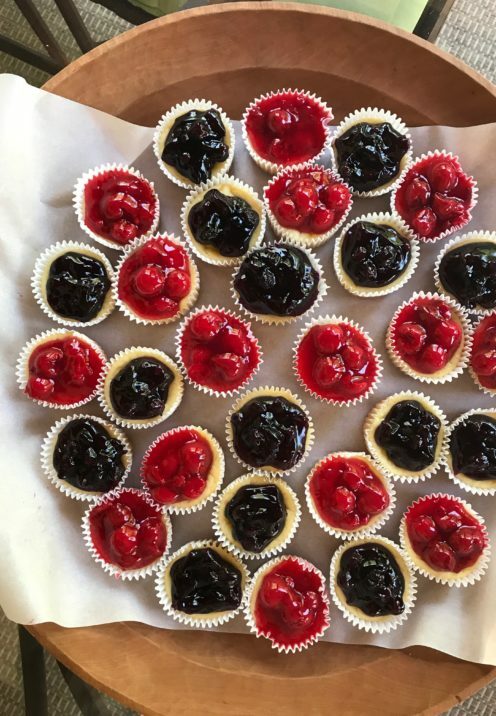 Using a teaspoon, top off half of the Mini Cheesecakes with the Cherry filling, the other half with the Blueberry filling. Store them covered in the fridge until ready to serve. 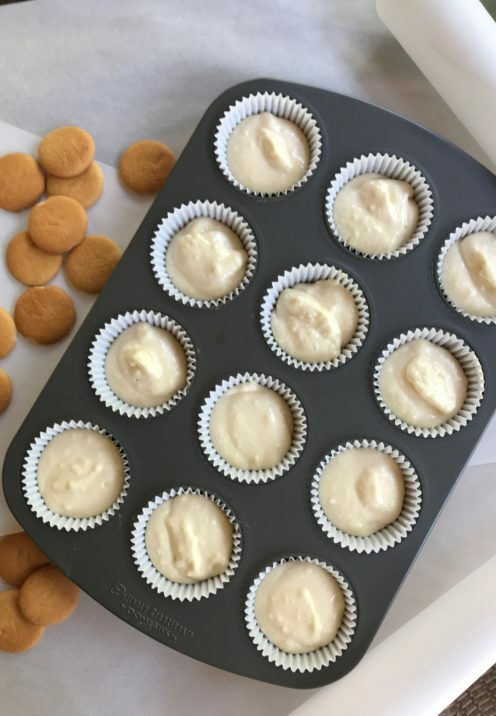 Finally, carefully remove your Easy Individual Mini Cheesecakes from the cupcake tins and display them on a large serving platter or tray. This recipe is easy to make and easy to serve. It makes a great patriotic dessert to serve on the 4th of July! 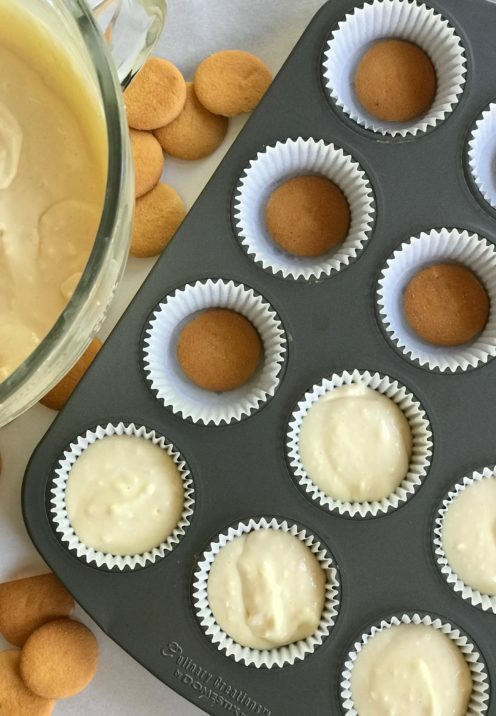 Line 36 muffin tins with white cupcake liners. Add one vanilla wafer to each cup. Add the eggs to the bowl of your standing mixer and beat them up. Add the sugar, vanilla and cream cheese to the bowl and continue mixing until the batter comes together. Batter will remain a bit lumpy and that's OK. Using a ⅓ cup dry measuring cup, scoop batter into each cup, filling them about ⅔rds full. Bake for about 30 minutes until batter is set. Cool completely in the pan. Mini Cheesecakes will be puffy at first and then they will settle down and look wrinkled. Using a teaspoon, top off half of the Mini Cheesecakes with the Cherry filling, the other half with the Blueberry filling. 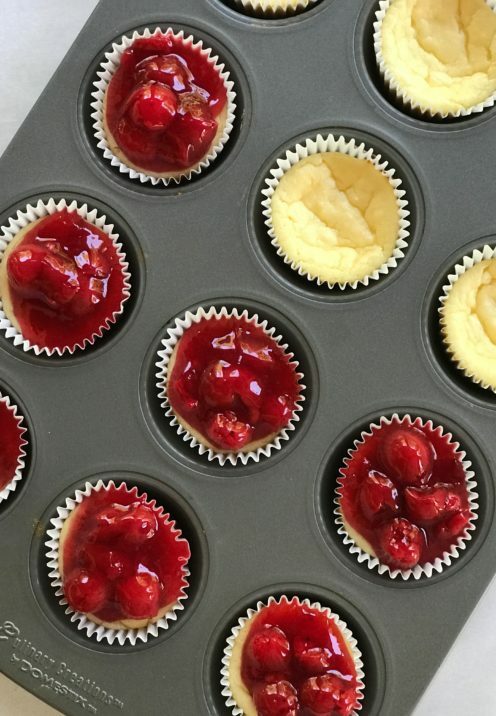 These Mini Cheesecakes can be prepared up to 2 days in advance of serving. Store the un-filled cakes covered in the refrigerator then add the filling the day of service.